I love steak but it can be a little expensive so one thing I sometimes do is buy skirt steak to satisfy my craving. You are probably already familiar with this cut of meat if you’ve ever had fajitas; it has a great meaty flavor and is actually one of my favorites. When cooked well it is awesome but can be a little tough if not treated right. 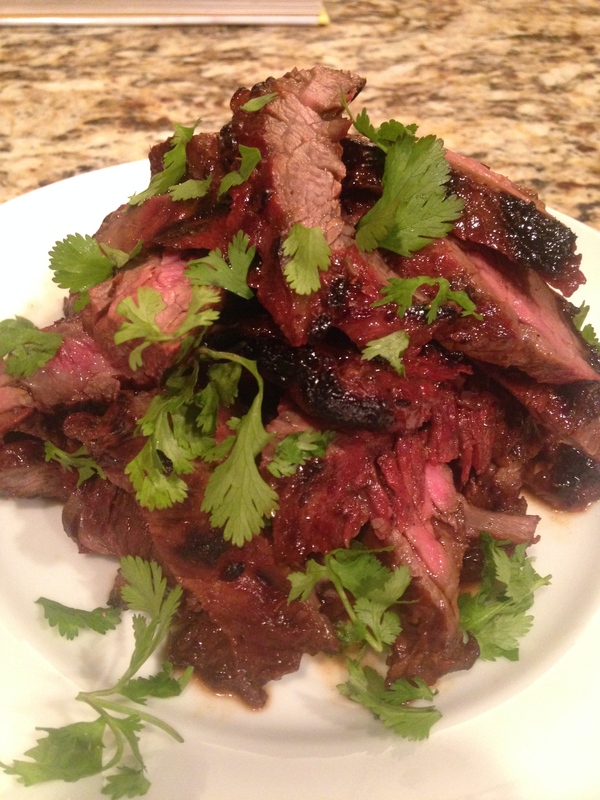 One skirt steak costs around $11 and can feed at least 4 people. It’s a deal. The solution to making skirt steak taste like something more expensive is marinating it for at least 6 hours, not cooking it too long and slicing it against the grain. Skirt steak is perfect for the grill as well and with the warmer weather finally arriving I decided to make use of it and put the grill back into action. I decided to call this “lacquered” because of the amazing color/crust the meat obtains after cooking. I love to sneak the charred ends while slicing–there are benefits to being the cook. 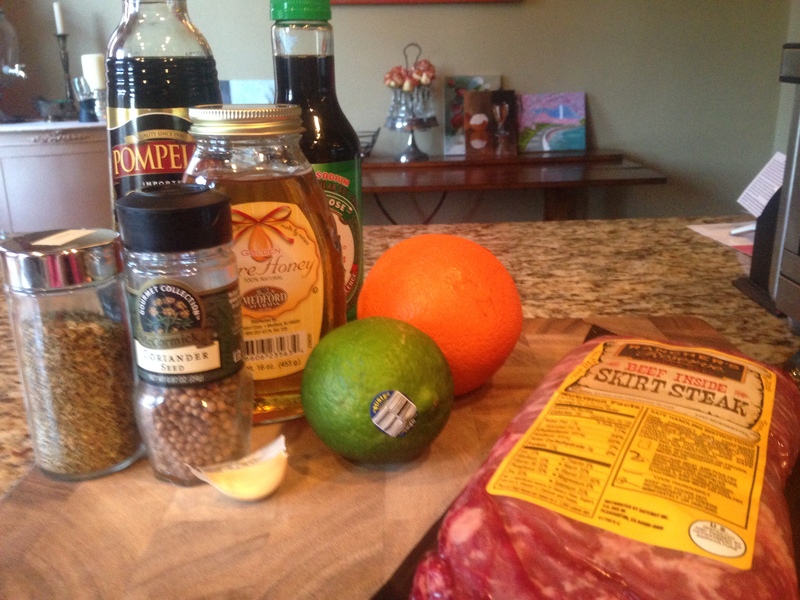 The first step was creating the marinade. I decided to go a little bit Asian in my flavors and hit some sweet, salty and umami notes. Just put all of the marinade ingredients in a non reactive dish. I like to mix it all right in a glass baking dish, the same one I marinate in to save dishes. Add the steak (cut it in half if needed to fit), cover and refrigerate for at least 6 hours or overnight. I always just make it in the morning after breakfast and then it is perfect by dinner time. And we’re marinating! Notice how defined the grain is here too–running sort of left to right. Make sure to cut against that when slicing for more tender meat. When it’s time for cooking, recruit someone to man the grill and cook for about 7 minutes each side. 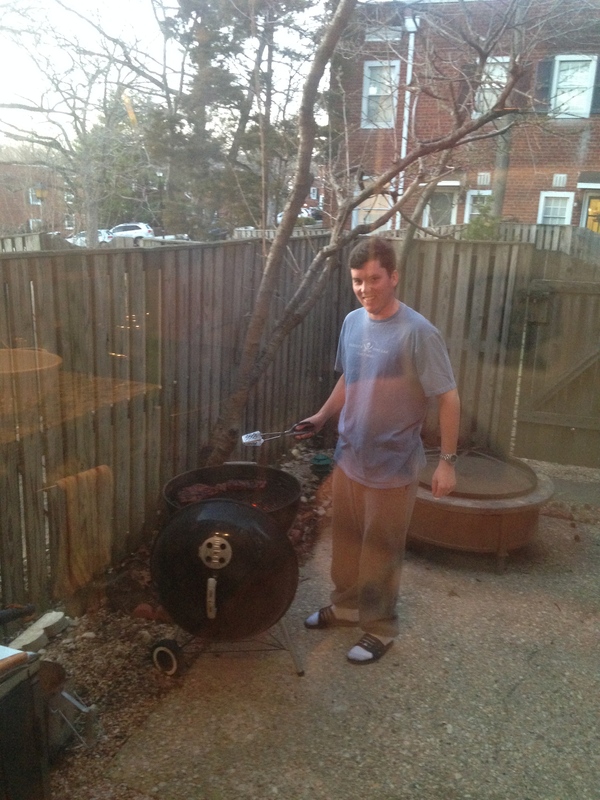 I’m always sneaking pictures of him while he’s out at the grill. Gotta love a man who grills. Make sure the grill is good and hot so you get a good sear. But be careful: the honey in the marinade can mean burning and a little char is great but not all over. I like to serve this with my Charred Asian Green Beans. Delicious! Mix all of the marinade ingredients (the first 11 things) and a glass baking dish and add the steak, turning it around so it is coated. 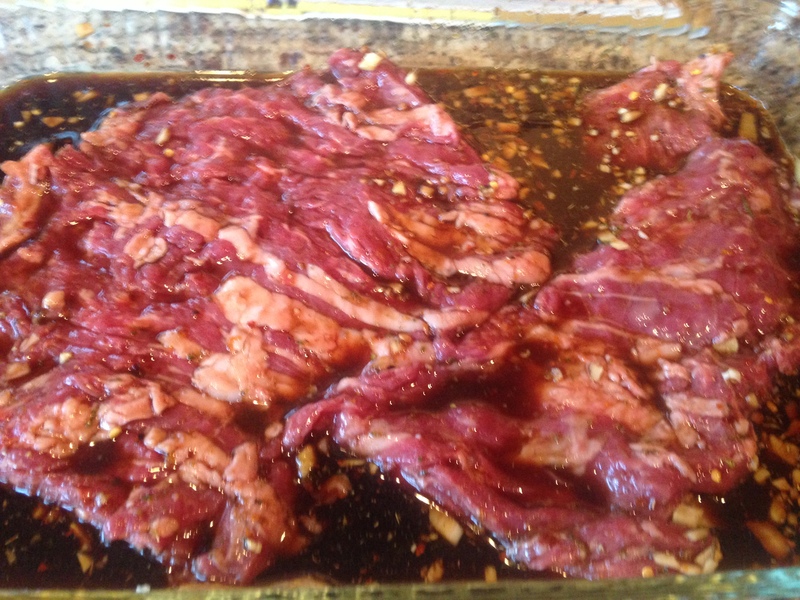 When ready to cook, discard marinade and cook on a HOT grill for about 5-7 minutes per side for medium rare. Pile the slices on the plate and sprinkle with plenty of fresh cilantro. OMG that looks so good I can almost taste it! !